Showing off her va-va-voom curves, Demi Lovato walked the black carpet at the 2011 MTV Video Music Awards held at the Nokia Theatre L.A. LIVE on Sunday, August 28th, 2011 in Los Angeles, California. The 19-year-old looked stunning in a short, beaded dress that hugged her curves perfectly and featured a plunging neckline. I heard via Twitter that someone was insulting Demi saying that she looked fat?! Not only should that person have an eye check-up immediately, but they should also seek out a class for manners. 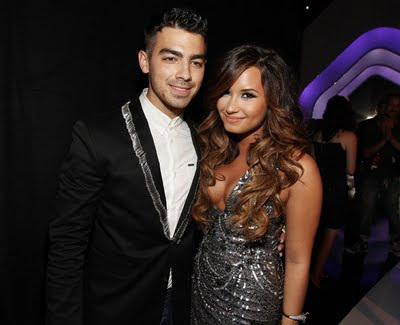 One person that seemed to not be able to keep his eyes off this Latina was ex-boyfriend (and one of my current crushes), Joe Jonas! I'm not trying to start rumors or anything but, is it wrong to hope this could be the start of a reconciliation? Based on Joe's song, "I'm Sorry" (which is rumored to be about his relationship with Demi) the guy has regrets about the past. Regardless, I'm happy to see Ms. Lovato looking happy and healthy. She's been working hard on a new album Unbroken, due in stores September 20. "It's definitely not pop/rock how I used to do. It's definitely more radio-friendly. It's more R&B, it's more pop, and I think you guys are going to like it," Lovato said during an interview with BFF Selena Gomez. "I got a lot of collaborations with Timbaland, Missy Elliott ... Jason Derülo." Lovato spent a good amount of time in the recording studio right here in Miami recently.